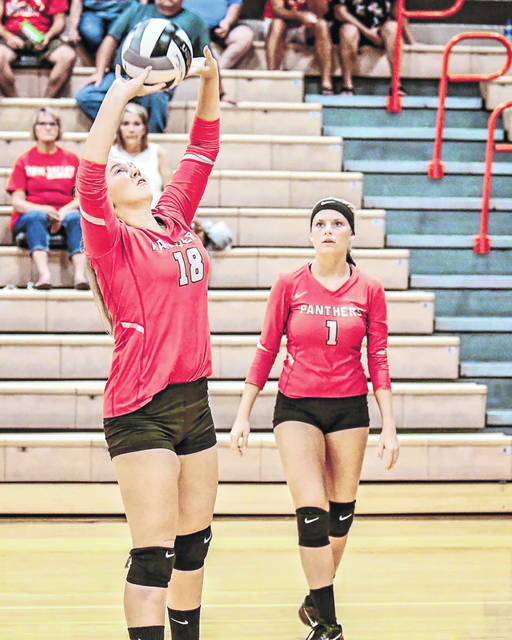 Twin Valley South’s volleyball team played three county teams last week, falling to Eaton, before beating National Trail and Tri-County North. PREBLE COUNTY — Twin Valley South’s girls soccer team defeated Stivers 5-1 on Thursday, Sept. 20. Allison Bassler netted a pair of goals for the Panthers. Abby Robertson, Makiah Newport and Madi Hundley also added goals. Newport added three assists. On Wednesday, Twin Valley South and Union County (Ind.) played to a 2-2 tie. Newport and Bassler each scored for South. On Monday, South fell to Preble Shawnee, 5-1. Twin Valley South’s volleyball team knocked off rival Tri-County North 25-19, 26-24, 25-27, 25-20 on Tuesday, Sept. 18. Twin Valley South’s boys golf team defeated Ansonia 200-231 on Monday, Sept. 17 at the Eaton Country Club. ”It’s hard to believe we’re already winding down, but when you play a quarter of the season in your first week, the rest of the season seems to fly by,” South coach Darcy Robinson said. The Panthers played without the services of Connor Bradley due to a previous family commitment, so they played with the bare minimum of four again. Robinson said Bowman stepped up into the No. 1 position. Twin Valley South’s boys soccer team defeated Preble Shawnee 3-2 Monday, Sept. 17. Aaron Clark assisted Brayden Marker to make it 1-0. Logan Davis then assisted Brayden Marker off a free kick to make it 2-0. Shawnee then scored to make it 2-1. Cade Carter then assisted Aaron Clark to make it 3-1. Shawnee scored late off a penalty kick to make the final 3-2. Will Jerdon had eight saves for the Panthers. The National Trail Boys golf team fell in its last match of the season at the hands of Miami East 177-235. Tyler Cohers took medalist honors for East with a 42. Leading the Blazers was Austin Knapp with a 51, followed by Tyler Porter’s 53. Sam Roberts carded a 62 and Kevin Christensen shot a 69 to round out the scoring. The team finished their season with a 4-9 overall record, 4-8 in the CCC.